Sagging Meniscus publishes nonconformist fiction, poetry and literary nonfiction by American and other originals. More about us. ☞ A new expanded edition of Tom McDermott’s Five Lines No Waiting. 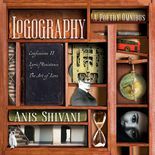 ☞ Logography, extraordinarily vigorous, electric poetry from the quicksilver mind of Anis Shivani. ☞ Ghost stories from Joe Taylor: Ghostly Demarcations. ☞ New books from Marvin Cohen: Sadness Corrected, new poems and dialogues; Life’s Tumultuous Party, a collections of short pieces about parties; and also a book of photographs of Cohen by Jeff Brown. ☞ My Life of Crime, brilliant essays from Tyler Gore. ☞ A new novel from M.J. Nicholls: Scotland Before the Bomb. ☞ New and selected poems by Aaron Anstett. ☞ A hardcover edition of Joseph Reich’s Magritte’s Missing Murals with illustrations by Royce M. Becker.